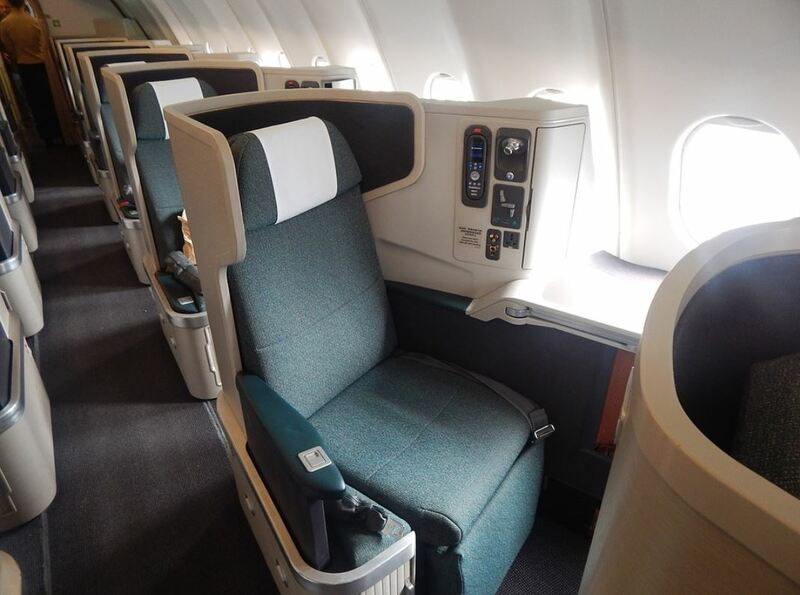 Can You Buy Very Cheap First Class Tickets Using Credit Card Points & Airline Miles? Yes. Traveling abroad can be very expensive. In fact, a lot of people prefer to stay at home, because they mistakenly believe that they’re not going to be able to afford it. It doesn’t have to be this way. If you use your credit cards wisely, you’re going to receive points and miles. Plus, you won’t find yourself in financial jeopardy. Ultimately, you’ll be able to use these to obtain cheaper first class tickets. In fact, you might even be able to accumulate enough points to pay for the entire trip. Within this guide, you’re going to learn more about buying cheap first class tickets using your points and miles. Regardless of your income, you may be able to afford business class airlines tickets. Most credit cards give their customers up to 1.5 points for every dollar they spend. These miles can be utilized to purchase affordable airline tickets. Depending on your destination, a single business class seat could cost you up to $4,000 and a first class seat up to $10,000. Even though you may believe these prices are ridiculous, some people are willing to pay extra just to get the best amenities. Now, if you save up your mileage points, you can apply them to these ticket prices, resulting in huge savings. (Or, you can sell your miles for cash). If you consider yourself a budget traveler, you probably never think outside the economy flight box. This is very common behavior among budget travelers, so do not consider yourself a loner in this situation. With that said, if you are willing to think outside the box, you could possibly score some very affordable business class award ticket. The only problem with these tickets is they will require you to invest more of your points. Another way to score business class tickets at affordable prices is by checking availability. It is not unusual for business saver awards to be available longer than economy saver awards. This is mainly due to the fact that most travelers are looking to score the cheapest tickets possible. One way to look at it is once the economy saver awards are sold out, the price of the economy award ticket will increase. And, in some cases these tickets will be higher than business class award tickets. The next time you are planning to fly, be sure to weigh your options before making any drastic decisions. First and foremost, you need to find out how you can obtain points and miles. The truth of the matter is that there are numerous ways to acquire points. It won’t be too difficult in the least. As mentioned above, using credit cards is going to help. Just remember that not all credit cards are equal. Some are going to provide you with most points than others. At the same time, you might be able to get huge sign up bonuses when signing up for certain credit cards. Suffice to say, you’ll want to do a little bit of research to ensure that you get the best cards with the highest return. You’ll also want to sign up for loyalty programs. Hotel chains and airlines often have loyalty programs that provide consumers with points and miles for using their services. If you’re going to be traveling with a specific airline often, you should definitely take advantage of their loyalty program. The same can be said about hotels too. Why shouldn’t you earn a little something for spending your money? You’ll also want to use online shopping portals. Always be on the look out for chances to increase your point total quickly! Once you’ve managed to rack up the points, it is time to start planning your trip. So, where do you want to go? This should be your first step. Once you’ve picked your destination, you’ll be able to find out how long you’re going to be away, how much money you need and how many points or miles are required. Be sure to choose a destination that is actually worthy of your time and money. After all, you’ll want to make sure that your miles are spent wisely. Once you’ve selected a destination, you’ll want to check out the first-class airfare that is going to be available for the trip. You can use many websites to access this information. Remember that some flights are going to have long layovers. Others may require you to arrive before the sun rises. This is something that you’ll want to take into consideration when planning your travels. Make sure that you choose a flight that is going to be convenient for you. If you do not want to get up at 4 in the morning, you should choose a flight with a later departure and vice versa. How Many Points Will You Need For Discounted First Class Tickets? Now, you need to figure out precisely how many points you’re going to need. It is going to depend on many factors, including your destination and the flight you prefer. There are plenty of tools online that can help you find the information that you need. Just remember that these tools are not going to deliver comprehensive information. They probably aren’t going to tell you when the award seat is going to be open. Also, you will not be able to find anything about the fees and taxes that you’ll be required to pay. Nevertheless, they will tell you how many points will be needed to get from your starting point to your destination. You’ll also want to use these tools to determine whether or not you’re going to be able to transfer your points. After all, some airlines are not going to accept points from certain programs. Many airlines will accept Starwood Preferred Guest Star Points. This is great, but unfortunately these points are very difficult to earn. Instead, you may need to choose a different airline to ensure that your points are going to be eligible for redemption. When it comes to using your points to get first-class tickets for cheaper, the most difficult part is going to be finding an available flight. You won’t know how many points and miles you need until you find a first-class seat that is going to be open. Otherwise, you might be earning miles for a route that is never going to have a seat open. At the end of the day, your goal is to obtain points as quickly as possible. Many people believe that the only way to earn miles is by flying more often. This isn’t actually true. There are many ways that you can earn more points very quickly. You just need to know how to move forward. First and foremost, you should think about signing up for a co-branded credit card. Do that and make sure that you meet the minimum spending requirement. That will usually provide you with enough points to acquire a free flight. Just make sure that you sign up for the right card. Check the airlines in your area and find out what the minimum spending requirement is going to be. You’ll also want to think about signing up for a flexible rewards credit card. The Chase Ultimate Rewards program is definitely a good one. It offers plenty of points and you’ll be able to use those points at many different airlines, including Southwest, Korean Air, United Airlines and British Airways. The sign-up bonus is great, but you cannot stop there. You need to keep using your credit card each and every single day. This is the best way to ensure that you’re going to continue accumulating points as quickly as possible. You can most likely earn miles when renting vehicles too. If you rent cars often, you should definitely look into this a little more. You’ve finally done it. You’ve used your credit card every day and you’ve earned lots of miles when traveling the world. Now, it is time to reap the rewards! Congratulations are in order. So, how can you actually redeem the reward? It is actually easier than you could ever imagine. You just need to visit a booking website and book your flight. In some cases, you might be required to call the airline to book your flight. Either way, getting those first class tickets for cheaper won’t be an issue once you’ve got the points and miles that you need. It is true that acquiring points and miles can be a little difficult and time consuming. Nevertheless, it is going to be worth your time and energy in the long run. Be sure to take advantage of all sign-up bonuses and continue using your cards every single day. Just use them wisely and make sure that you’ll always be able to pay off the balance. Otherwise, your journey for cheaper first-class tickets is going to lead you into trouble.